HALIFAX - The U.S. government's decision to stall the Keystone XL pipeline project will harm American energy security and the economies of both the U.S. and Canada, says the federal finance minister. 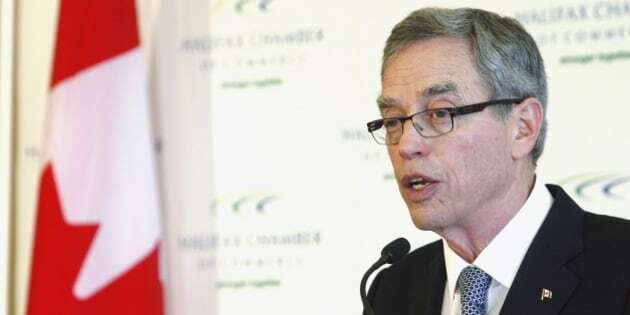 Joe Oliver said Tuesday that the U.S. administration's indefinite delay of the project hurts employment on both sides of the border. "I'm very disappointed by the American decision to delay yet again this project, which is perhaps the most studied natural resources project in the history of the world," he said after giving a speech to the Halifax Chamber of Commerce. The U.S. State Department announced Friday that it wants to give federal agencies more time to review the $5.4-billion proposal by Calgary-based TransCanada (TSX:TRP). Washington also says it won't issue a permit for the pipeline to cross the border for now while the proposed route is being disputed in the Nebraska court system. Oliver said the energy security of the U.S. depends on having multiple sources of oil. "There's a national security issue here because Canadian crude oil will be supplanting Venezuelan crude oil. Let's not forget that Venezuela threatened to cut off the United States five times in the previous five years," he said. "We see the vulnerability countries have when they rely on non-reliable sources of energy." Oliver said delaying the project also delays the creation of thousands of jobs. But critics with the opposition say the Canadian government has lost influence with the U.S. and the Keystone decision shouldn't come as a surprise to Oliver. Nathan Cullen, the Opposition NDP's finance critic, said the Conservative government hasn't been diplomatic enough. "The insult and the incredible lack of diplomacy from Mr. Harper going after Mr. Obama has backfired," he said. Liberal finance critic Scott Brison said the Keystone deal would have been completed under previous Conservative or Liberal governments because there were better relationships between Ottawa and Washington then. "Harper doesn't play well with others," he said. Oliver's remarks also generated criticism from NextGen Climate, a group created by U.S. billionaire environmentalist Tom Steyer that opposes the Keystone XL pipeline. "The big lie of Keystone is that this export pipeline is somehow going to help U.S. energy security," said NextGen Climate consultant Mike Casey in an email. "Mr. Oliver continues to assert this falsehood from the tarsands lobby, but neither he nor TransCanada will testify under oath how much refined oil will stay in the U.S."
Prior to speaking to reporters about Keystone, Oliver gave a speech to a business audience that emphasized his government's efforts to control spending and balance the budget. "Our government will not engage in reckless new spending schemes that would lead to increased taxes or higher debt or both," Oliver said. "We worked too hard to return to a balanced budget to throw it all away. We will not go down that well-trod path to economic decline." The International Monetary Fund dropped Canada down in its growth forecasts earlier this year, predicting the U.S. will experience the strongest economic growth among the G7 countries this year. Oliver said he's not concerned about Canada lagging being U.S. economic growth, as the American economy has had further to recover from a global economic downturn that spread around the world five years ago. He took over the finance portfolio after Jim Flaherty's resignation last month.